Bill was born and went to school in Brynmawr, and joined the army, very appropriately, on ‘Fireworks Day’ 1940 aged 18. His first posting was to 7 RWF, which was part of the Northern Ireland garrison at the time. In March 1942 he joined 4RWF in 158 Brigade. For the next two years they trained intensively for battle throughout UK. Then on 25th June 1944 Bill, a Fusilier in the Assault Pioneer Platoon, sailed aboard the liberty ship “Cotton Mather” for Normandy. There were forty-nine other ships in the convoy escorted by destroyers and corvettes, with US fighter planes providing air cover. What excitement for a young man of twenty-two. As soon as they landed they were in the thick of it, and Bill as an assault pioneer would have been in constant danger, clearing mines, crossing water obstacles, and so on. He took part in the bocage battles of Normandy, the canal actions in the Low Countries, the capture of S’Hertogenbosch, the Ardennes, weeks fighting in the dark Reichswald Forest, the savage Rhineland battles, and at last, now a Lance Corporal, celebrated victory in Hamburg. Someone described him as “prodding for mines all the way from Normandy to the North Sea”. But who among us ever heard Bill speaking, far less bragging, about these exploits? On the way he lost many friends and he never forgot them. On subsequent pilgrimages to the battlefields, and notably to Evrecy, he visited their graves. There he prayed openly; he talked to them: “I have come to visit you, Jack, one day I will join you, but I’m in no hurry”. In 1946, on disbandment of 4RWF, Bill transferred to the 1st Battalion. In 1951 he was a Corporal Storeman in D Company in Wavell Barracks, Berlin and later that year the Battalion was posted to the West Indies. 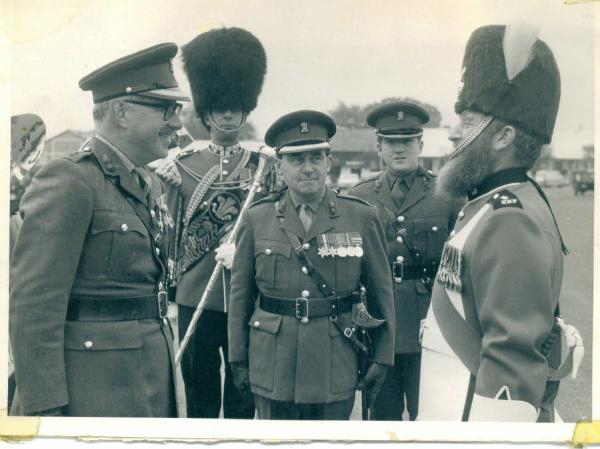 Bill was promoted to become the Pioneer Sergeant and would henceforth lead the Battalion on parade and ceremonial occasions and was, uniquely, entitled to wear a beard. 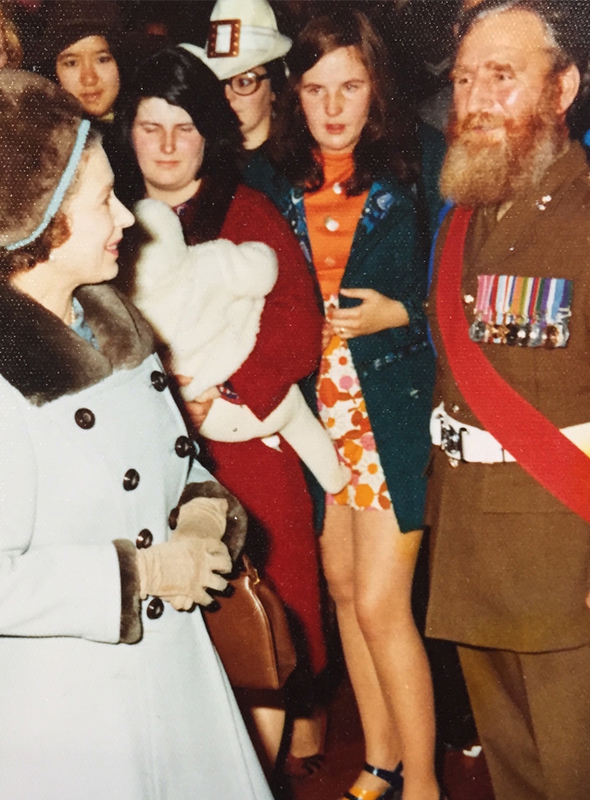 From then he sported the magnificent red beard, which became famous throughout the Army. The Caribbean was followed by Chiseldon in 1954, Dortmund a year later and Berlin in 1956 then it was 1958 when the Battalion moved to Cyprus at the height of the EOKA campaign. One of our tasks in Cyprus was to search for and destroy caches of EOKA terrorist weapons. The destruction of them fell to Bill and his team. The actual use of explosives was almost exclusively done by him personally. On the constructive side he also achieved an enormous amount. In Cyprus the Battalion was dispersed in small and inadequate camps. Bill and his small team made an immense difference to improving conditions. Cookhouses were built, water piped in from local sources, electricity was installed and amenities improved in every way. He built a chapel at Aghirda Camp, and a new office for the CO. All this was done with limited materials but with great initiative and resourcefulness. He would look at the problem, stroke his beard with that quizzical look in his eye and then achieve miracles. This was repeated wherever the Battalion was posted across the globe: - Germany, Cyprus again, Hong Kong and Northern Ireland. He must have built dozens of magnificent Sergeants Mess bars which he then enjoyed patronising. 1966 saw 1RWF back in Cyprus, this time with the UN Peacekeeping Force. Once again he distinguished himself improving inadequate facilities. After this tour he was awarded the British Empire Medal for his many achievements. Typically, he was quite embarrassed and shy about it. Every man’s career must eventually some to an end. Bill’s service was extended almost a record number of times but eventually he had to retire. He for ever remained a stalwart of his branch of the Comrades Association and attended their meeting in Brecon on the Tuesday before he died. He was at Comrades weekends in Wrexham without fail every September, and he was taken happily to Chester for the Queen’s visit to the Regiment last year. He was a man who by nature of his ceremonial duties met many VIPs and VVIPs, from the Queen downwards. His great courtesy and charm never failed to impress. At the same time, if one of his pioneers had a personal problem, they could always count on Bill for sympathy, support and very real help. His simple but steadfast faith was put into practice through his compassionate personal relationship with all who knew him. Bill’s funeral was held at Brynmawr on Thursday 17th February 2011. Many old friends, Officers and Comrades attended his funeral. Major General RM Llewellyn gave the eulogy and at the farewell drinks Lt Colonel MA Lloyd, as Chairman of the Comrades Association read out a farewell message from our Colonel in Chief, HM The Queen who expressed her sorrow at our loss. Jesus said: “In so far as you have done it for the least of these brothers of mine, you have done it for me. Enter now the kingdom which has been prepared for you since the foundation of the world”. We can be sure that Bill is now at peace with his comrades in that eternal kingdom. The last word comes from Tony Corbett who wrote: “And Peter said: ‘Lord, I have found a good man to repair the gate”. God bless you, Old comrade. 2734649 Cpl E.P. (Ted) Jones MM. Edward Pryce (Ted) Jones MM was born at Tybrith Farm, at Cloddiau, Welshpool, in 1919. 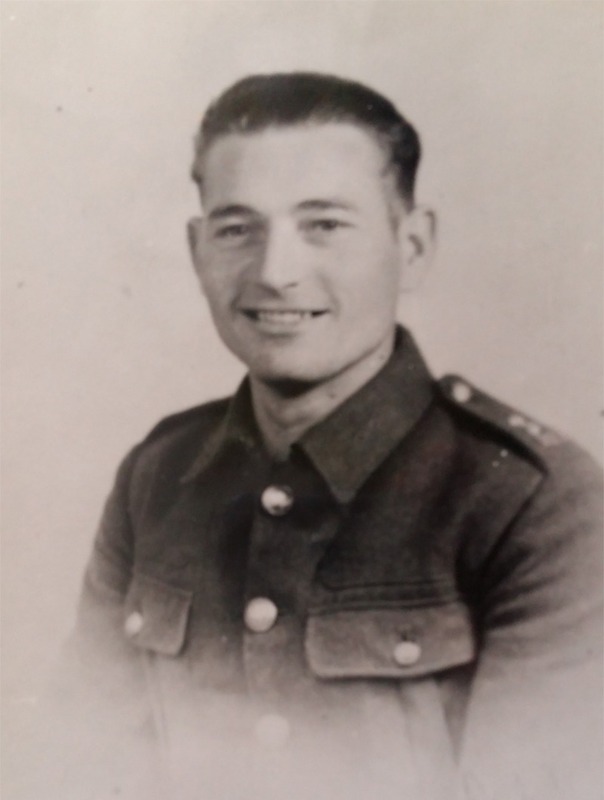 Ted joined the army in the late 1930’s, initially enlisting into the Welsh Guards. He was mobilised with the 7th Battalion, RWF at the outbreak of WW2 in Sept 1939 and then with all the other 18-20yr olds from his unit, transferred to the 10th Battalion RWF, which was stationed at Beaumaris, on the island of Anglesey, North Wales. Early in 1940, the Battalion was posted to Plymouth, Devon. Ted had volunteered for “Special Duties” with 9 Independent Company, which was to be the forerunner of the Commando and Special Forces units. On June 14th 1940, he joined 11 Independent Company, who had been ordered to plan the first ever commando-style raid against the Germans, now holding the French coast in force. The raid was codenamed “Operation Collar” and personally sanctioned by the Prime Minister, Winston Churchill. Ted and his comrades, under the command of Major Ronnie Tod, commenced ten days of intensive training, including watermanship, boats, street fighting, and use of the Thompson Sub-Machine Gun, a skill that Ted was to use to great effect nearly five years later! Ten days later, on the evening of the 24 June 1940 at Dover, Ted and 114 other men climbed into four RAF search and rescue patrol craft and crossed the English Channel to attack 4 objectives, one target per boat. The aim of the mission was to kill or capture the enemy and obtain intelligence. We think Ted’s objective was Stella Plage. The staff officer who conceived the raid, Lt Colonel Dudley Clarke, accompanied Ted’s troop in their boat, as an observer. He would later become the Allies acknowledged expert on Deception Warfare. Ted’s group reached the French coast at about midnight. They were unlucky to land as the German sentries patrolled past. Ted can recall the sentries cocking their rifles. The raiding party opened fire and killed them, which then resulted in a further firefight with a larger German force. During the gun battle their boat had withdrew to mid-channel. Ted and his comrades were then stranded in the dunes behind the beach for over an hour, hiding from the German forces, before their boat finally returned closer to the beach. They were eventually forced to dump their kit and swam out to the craft, then being successfully extracted back to Dover. The only British casualty was the observer and planner Lt Col Dudley Clarke, who suffered a flesh wound from a German bullet. The operation, in which the soldiers had received only minimal training, had mixed success, but it crucially convinced Churchill that Commando units, with intensive training and good equipment could be highly effective against the enemy. Within 12 months Commando units were actively taking the fight to the enemy. After the raid, Ted transferred to the 2nd Battalion RWF, part of 29 Independent Brigade, who were undergoing intensive training in Scotland, based around amphibious operations. On the 24th March 1942, Ted and his comrades aboard HMS Karanja, set sail from the River Clyde in a large shipping convoy, heading to South Africa. After stopping for supplies, they proceeded to the island of Madagascar. Held by the Vichy French, and with its deep-water harbour, it was considered by Allied planners to be vulnerable to Japanese occupation, and the Allies therefore needed to seize it. It took four-months of hard fighting against the Vichy French who were supported by colonial troops and the French Foreign Legion to capture it. 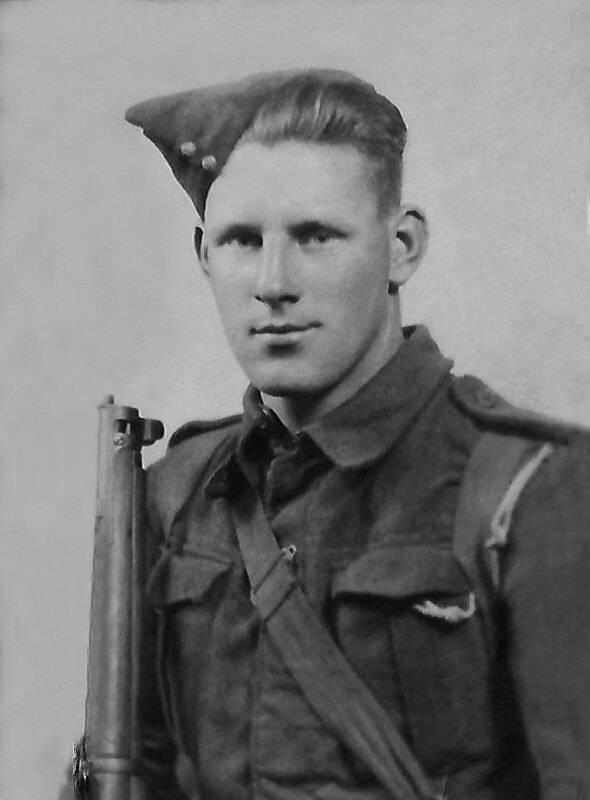 Ted, a big strong farmer, armed with a Bren Gun, was in the thick of the fighting throughout, and can recall escorting his Commanding Officer, Lieutenant Colonel Stockwell and Brigadier Festing, the Brigade Commander, as they entered the Governor-Generals Residence at Antisarane on the morning of the 7th May, later witnessing the surrender of the garrison to Brigadier Festing. Ted also witnessed the successful Japanese midget submarine attack against HMS Ramillies and the oil tanker British Loyalty on the 29th May 1942, in the harbour of Diego Suaraz, in which the warship was severely damaged and the tanker sunk. The island was fully under British control by September 1942. Although British casualties were relatively light, many of the men involved in the invasion, including Ted, suffered from malaria, and it took 2 RWF several months to recover its full fighting strength. Teds next exploits took him to Burma and the Arakan, where he was to spend the next two years fighting the Japanese. Initially in the Mayu hill range of the Arakan, later in Northern Burma, as part of the 145-mile advance along Railway Corridor, heading south from Myitkyina to Katha. 2 RWF excelled at small-scale engagements against the enemy, and were more than a match for their Japanese opponents. Living and fighting in the dense jungle became their way of life, and Ted as a country boy, was more than able to cope with this incredibly harsh environment. He was by now a Cpl and in command of an eight to ten man section. His undoubted leadership skills were put to the test on the morning of the 11th January 1945, as he patrolled with his Section near to the banks of the Irrawaddy. Below is the subsequent Citation for his bravery, for which he was awarded the Military Medal. 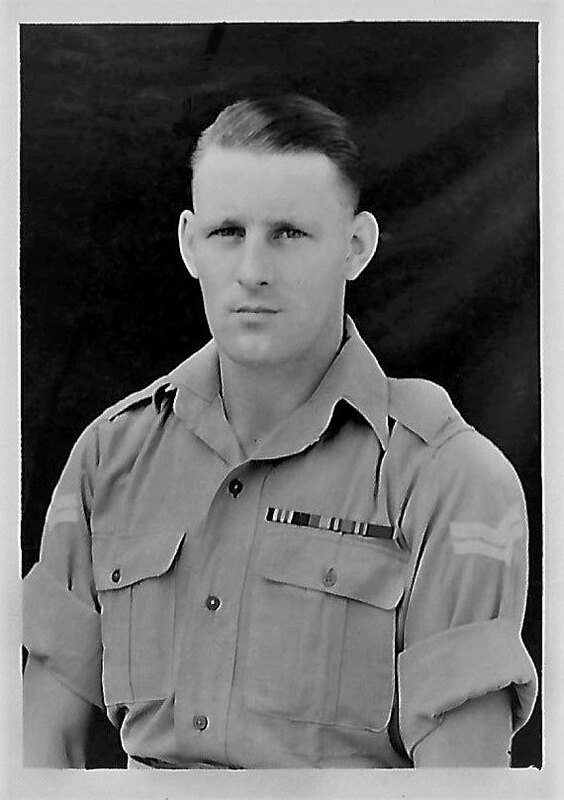 “On the 11th Jan 45, Cpl Jones was one of the Section Commanders of a Fighting Patrol which was sent forward from Shadaw to contact an enemy position on the track North of Myega. As his section was advancing along the track it came under heavy fire from Jap LMG’s and rifleman in bunkers on either side of the track. Cpl Jones immediately rushed one of the bunkers by himself, and killed both occupants with his T.S.M.G. (Thompson Sub-Machine Gun). He then led his Section onto some foxholes where he himself killed four Japs with his T.S.M.G and Grenades. Cpl Jones’ gallantry could not have been surpassed, and his dash and inspiring leadership under fire was an example to the whole platoon. The detailed and accurate information brought back by this NCO was of such value that a further plan was made that ensured the success of the next operation. Cpl E.P. Jones MM, India 1945. Ted can recall the incident clearly. He actually spotted the enemy ambush postion, just a few meters ahead as he patrolled, and had the strength of character to continue past the enemys muzzles, that he could see poking out of the undergrowth, Once immediatley past, he took a few steps into the jungle foliage, putting himself behind the enemy postion and fired a long burst into the rear of the Japanese bunker, followed by grenades. After a brief firefight and much confusion amongst his men, he collected his section; and moved about 60 metres away in order to regroup. He was then ordered by his commander to return to the bunker and hold the position. As he did this task, he caught the enemy hurridly trying to collect their dead from the bunker. Ted initiated a further firefight, again causing multiple enemy casualties! Ted did not return home to his family in Welshpool until 1946, where he married and raised a family on his small farm. Like millions of other men of his generation, putting his experiences behind him and concentrating on living a good and productive life. 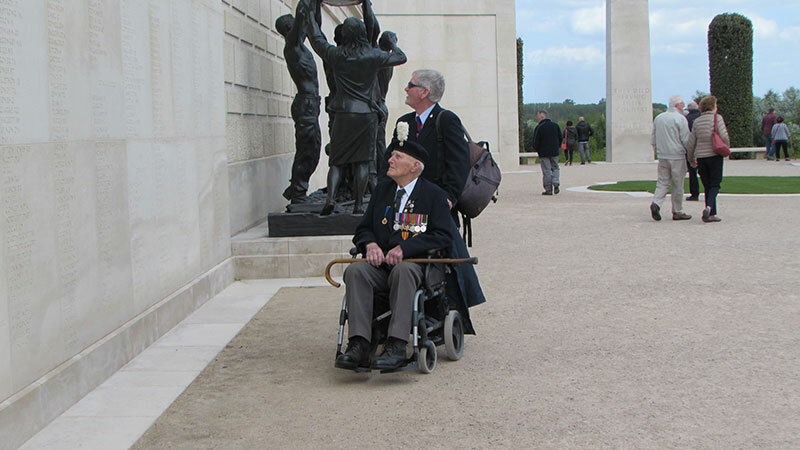 Today, Ted is still active in his local RWF Comrades Branch, attending lots of engagements throughout the year. In 2018 he took part in Weshpool Town’s commemorations of the Great War, he also attended the Burma Star National AGM at the National Arboretum, and the Welshpool RWF Comrades Xmas Lunch in December, this is just a few of the many events and functions he’s involved in. He also meets up with fellow Veteran, Jack Ellis MBE, who served with the 6th (Royal Welch) Para Battalion, every week at a local community centre in the town. In December 2018, Ted celebrated his 99th Birthday. 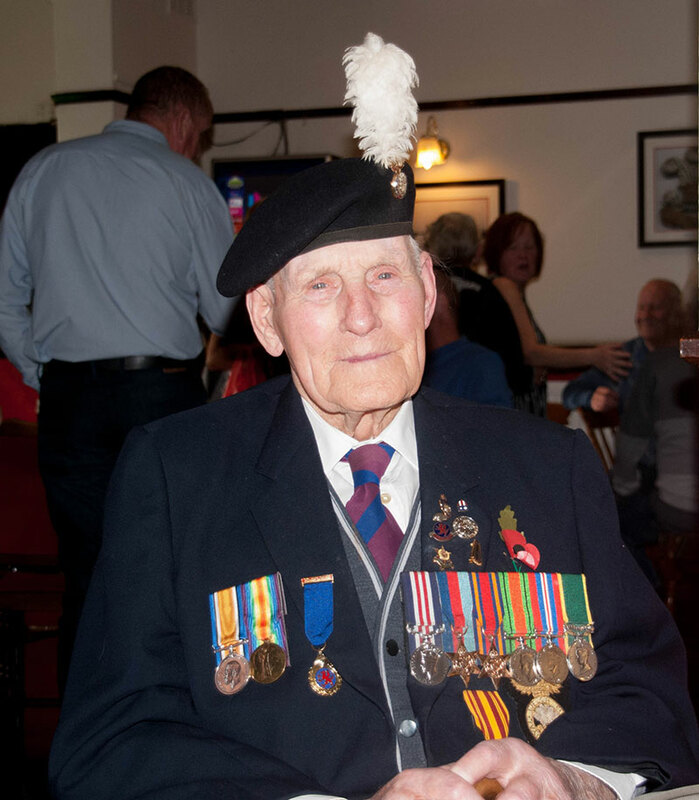 We believe he’s the only Second World War RWF Veteran, in receipt of a gallantry award still alive. It’s the hugely courageous actions of Ted and many other Royal Welchmen in the Second World War, who by their actions wrote another chapter in the long distinguished history of the Royal Welch Fusiliers. 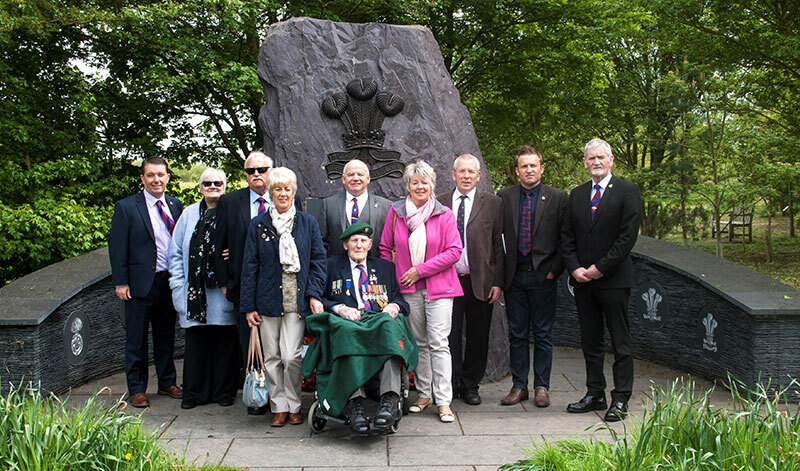 Ted with Comrades and friends at the Roayl Welsh Memorial at the National Memorial Arboretum. Ted and fellow Comrade Mr Colin Rogers view “The Wall” at the National Arboretum, Staffordshire. Pictured at the RWF Comrades Assocation Annual Reunion. The full story of Fred Sheady was unknown in the UK until 2016. Until then British records show him as “Killed Whilst Escaping,” with no known grave. We gratefully acknowledge the help and assistance provided by Mr Marcin Grybos and our Polish friends who worked tirelessly with us to help piece together this sad but amazing story of determination and human spirit. 22 April 1933. 4189938 Frederick Edward Sheady attested into the Royal Welch Fusiliers, joining the 2nd Battalion on their Foreign Service tour. Fred was from Flint, North Wales. December 1938. Fred returns to the UK as his military service starts to draw to a close, and he’s posted to 1RWF, based in the UK. In Sept 1939 at the onset of WW2, 1RWF is deployed to France as part of the BEF. Fred goes with them. By now he’s a married man of only eight days, with a family home at Prince of Wales Avenue, Flint. 16 May 1940. 1RWF come under sustained German attacks whilst defending the River Dyle at Ottenbourg on the French/Belgian border. At 2200hrs following the collapse of French Forces further along their line, they are ordered to withdraw. A few days later Fred is reported missing, later he’s reported “Wounded” and confirmed to be a Prisoner of War. He was being held at Larmsdorf, Southern Poland, within Stalag VIIIB. His allocated Prisoner of War number: 16929. Over the next two years, Fred, makes at least seven attempts to escape from the camp, his Polish companions later confirm his prime motivation was to get back to his family in Flint. 7 Sept 1942. A group of twelve POW’s including Fred managed to escape from a workcamp. Literally minutes before the attempt, Fred partners up with a member of the RAF of Polish/Jewish extraction, they escape together. This airman spoke fluent Polish and had family near Krakow. 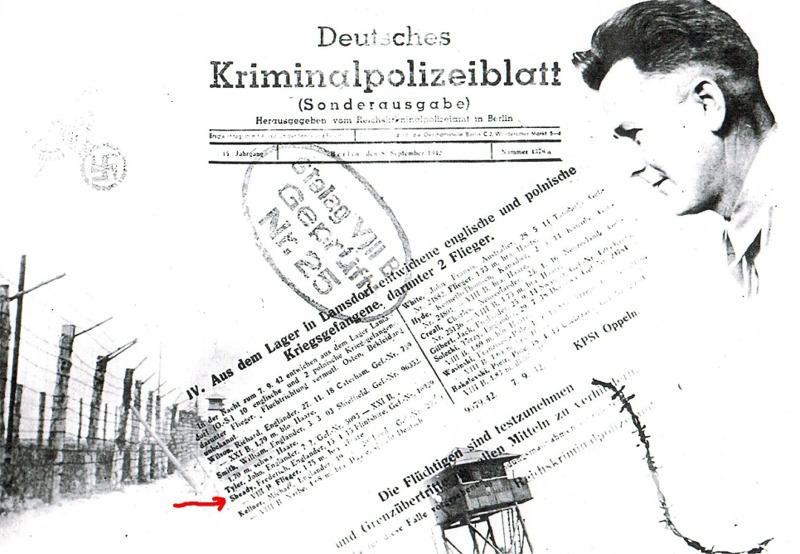 Fred’s name later appears on a German Police “Wanted” poster. We know the Jewish airman was captured four months later, and then escaped again, this time making a homerun back to the UK. The picture now gets murky and we temporarily lose track of Fred’s movements. 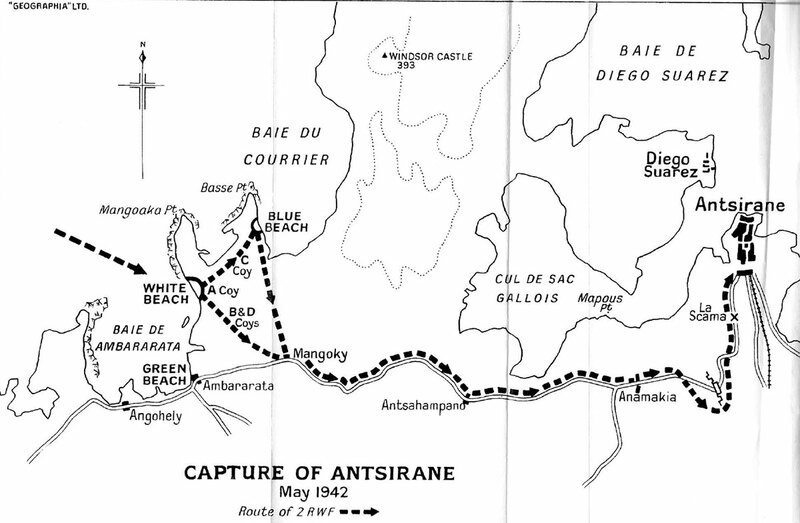 9 November 1942. 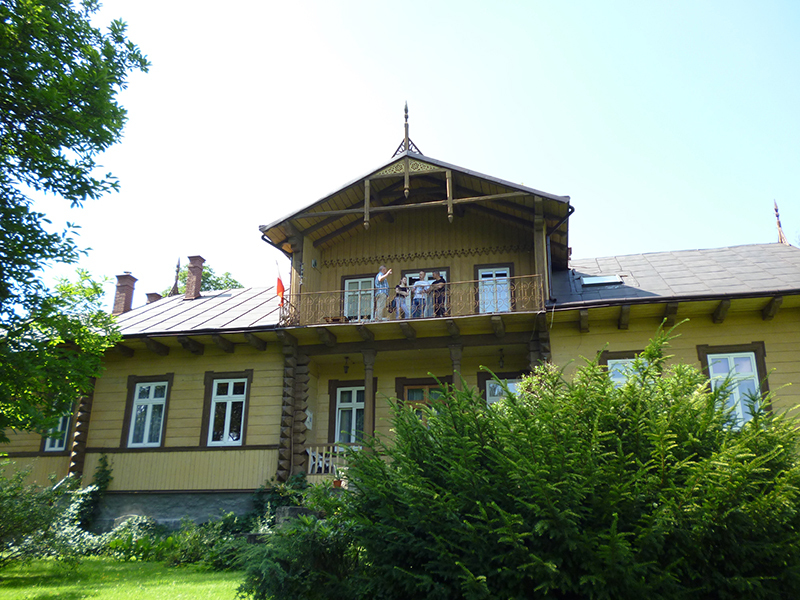 Stanislowa and Fred arrive at her home in Bystrzyca. He spends Christmas with her and her family, hiding in the attic room. The Groblewska House today. The attic room can be seen. 28 February 1943. The Gestapo is now looking with suspicion at the Groblewska family, Fred is quickly moved to a partisan hideout, deep in the woods in the Gorlich District. He now gaining the trust of his fellow partisans and beginning to speak polish. 10 March 1943. Fred is killed at the village of Stróże, being summarily shot by German Railway Police as he attempted to surrender. Fred’s group had arrived at a house in the village the day before they were due to purchase ammunition. However a local man had informed on their operation. The Germans surrounded the house, and then using grenades, launched their raid. Only a couple of the partisans were armed, and of the six men, two managed to escape, the remaining four, including Fred, were killed inside or in the vicinity of the house. We know that Fred initially escaped from the house, but still weak from years of captivity, no exercise and a poor diet, he was quickly chased down by the German Police, he then attempted to surrender and was killed on the spot. The German unit then burned the house to the ground. 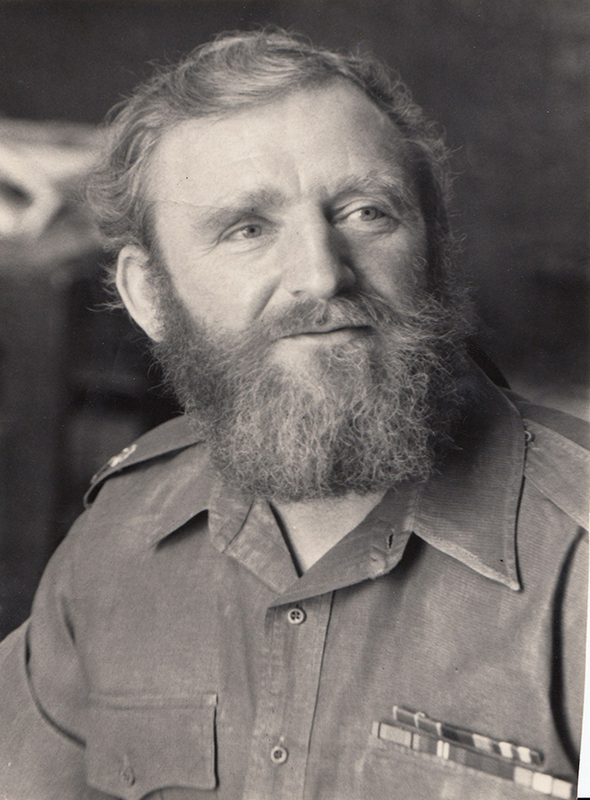 One of the escapees, the group leader, Franciszek Paszek (Codename: Kmicic) hid in a nearby farm shed and later escaped during the night by climbing through the shingle roof. His testimony was recorded in a Polish book about the Partisans, published after the war, and also in the biography of Stanislawa Groblewska, with whom he spoke with a day or so later. 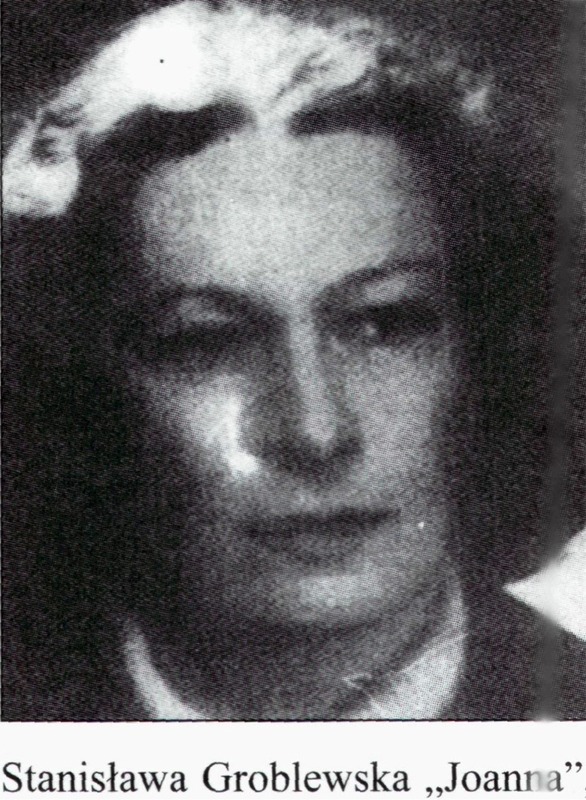 On the 12 March, Groblewska wrote in her diary "The bodies of the partisans were buried in one grave .., Fred Sheady from Flint in Wales who was buried in a cemetery in Stróże will remain with us forever” She also added in her diary on March the 12, 1944 the memories of "Kmicic" who survived and she concluded: " All the partisans were buried in a cemetery in Stróże "
A short while later the Partisans exacted their bloody revenge. The partisans gunned down the man who informed the Germans of the Stróże partisan operation to purchase ammunition. Then a few weeks after Fred was killed, an escaped Canadian Flying Officer Hubert Brooks, and his British Co-Pilot, who were involved with a nearby partisan group, attacked the German Railway Police, herding a number of them into a room and shooting them dead. Immediately the war, during the Stalinist purges, the Polish Partisans (AK) were treated as a threat to the State, imprisoned and often killed. The local government therefore ordered the bodies of the men to be exhumed and reburied outside of the district. 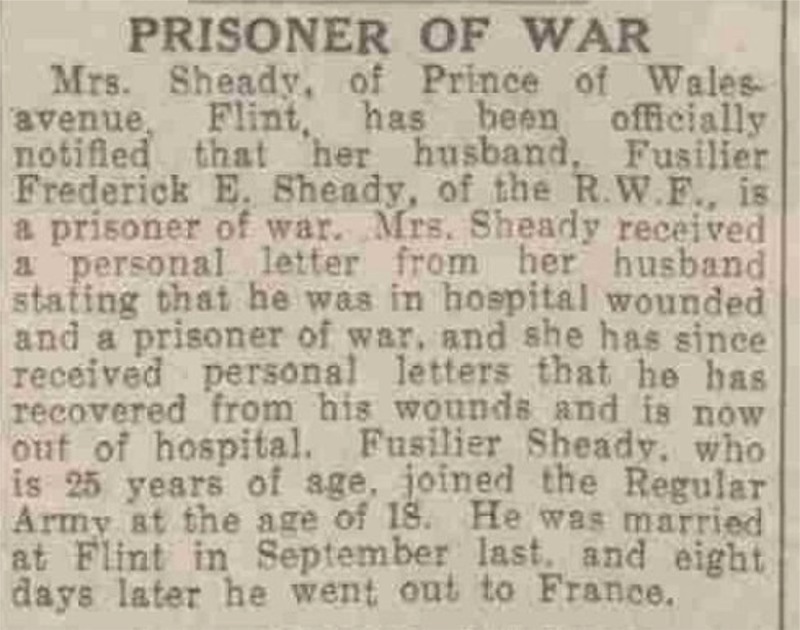 Sadly, we have not been able to locate the final resting place of Fusilier Fred Sheady and his fellow partisans. The villagers at Stróże erected a memorial to the four men at the location of their original gravesite. This is now the focus of their remembrance. 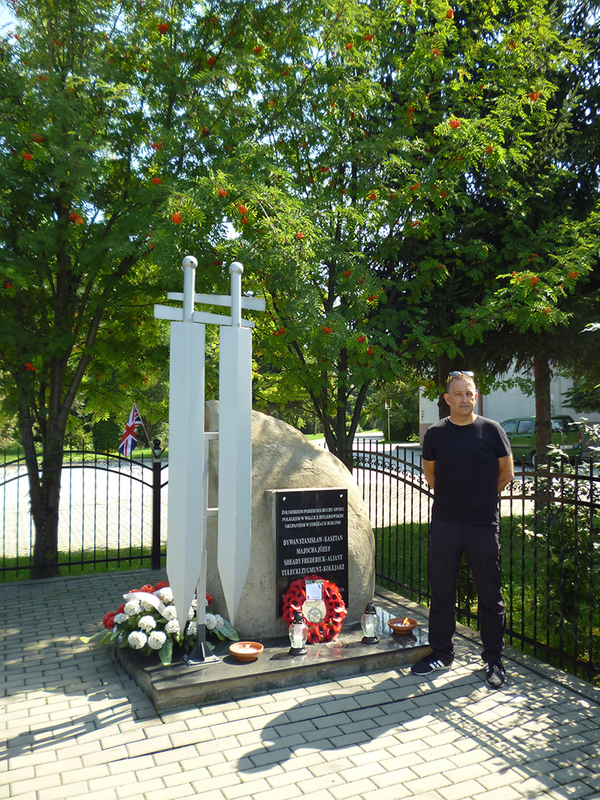 Recently Peter Sheady a member of the present-day family travelled to Poland, met and thanked our Polish researchers and laid a Royal Welch Fusilier wreath at the memorial in the village of Stróże.